Summer is here! Are you planning to go for a beach vacation? It's time to do some preparation! The Deluxe Beach Mat will be the only mat you will ever need in your lifetime. 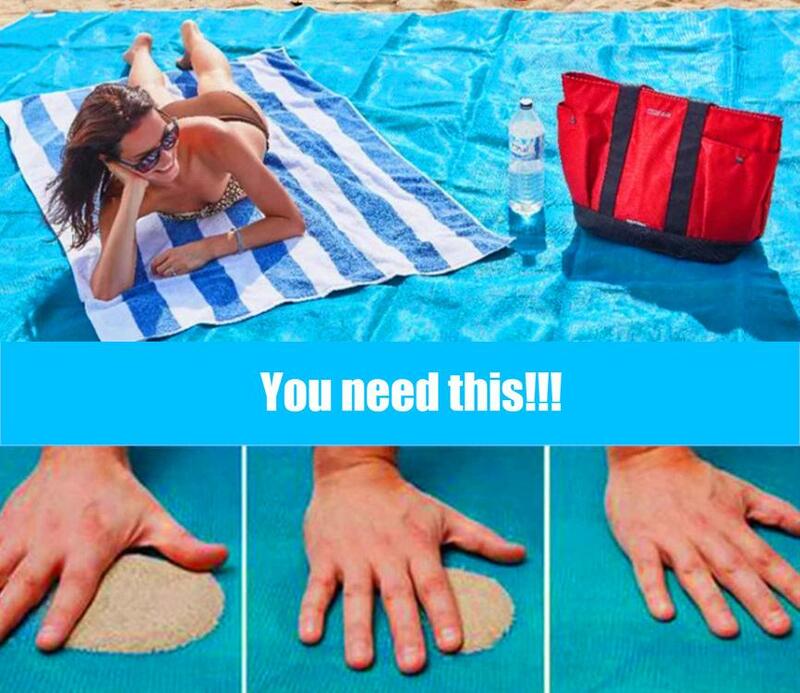 Sand free – Sands on the beach will leak out from small holes on the sand proof blanket, it's easy to sweep sands off, ideal for going to beach. Soft and comfortable – Double layer beach mat makes it more comfortable to lay on, soft material give you more relaxing experience. Various purposes – Not only for beach, this sand free mat can also be used when hiking, camping, and various summer and outdoor activities. Easy to clean – After using, just shake it, you can see sands off the sand proof blanket quickly and cleanly. After washing, it will dry quickly. Big size – The sand free beach mat is 57in X 78in, enough for a family to use. And when it folded, it gets small and compact, easy to carry. Ideal for the traveler or backpacker who needs to go lightweight as this is a great solution for multiple places, whether it is going to Miami Beach, the desert dunes of the Sahara, laying to rest on the Machu Pichu trails or just doing a picnic in Central Park, New York. Its ample size of 200 cm by 150 cm is suitable to fit friends or the whole family. We only have a limited quantity of these mats. Should you see a “NO ITEMS LISTED” note at checkout, please contact us and we will let you know when we have it back in stock.